Isn’t it gas how childhood experience can put one off a particular food for decades? For me it happened with porridge. I couldn’t stand the stuff. Made on water. Salt added. Yuk! No matter where I was – home or away – the last thing I’d gravitate towards was that oaty repast. Teens, 20s, 30s, 40s even – I still gave it the un-glad eye. You’re probably wondering why, given that it is a wholesome food and one that reared a nation. Yes, isn’t it full of down-to-earth goodness that nutritionally speaking, knocks the socks off all sugary cereals and toasty pretenders? My dislike was born of cleaning the pot. Simple as that. Having to do it. Hating to do it. 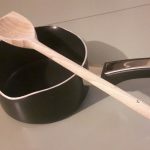 I was a child in the days before non-stick saucepans – what a life transformer they have been! It was also the era of dishwashers always having two arms and two legs and of there being big families and children doing a big share of housework. It was just the way it was. Girls helped out with the ‘inside work’ – housework – and boys did a lot of the heavier outside tasks, particularly if you lived on a farm like we did. So what, you might ask? Why fuss about a porridge pot? Well, if you’ve ever tried to clean a (non) non-stick one that porridge had been made in many, many hours before, you’ll know what I’m talking about. Think tough going, think some left in the bottom, think the only way to get the glubby remains out is to use one’s fingernails… Yuk! Think scrubbing pad and all the gunge stuck in it… It was enough to turn one off getting home from school. This cleaning challenge occurred in spite of the many hours of ‘steeping’ that the pot had. I wasn’t very old before I categorised ‘steeping’ under a ‘putting it on the long finger’ mind set where you hope that some other person will come along and do what you can’t stand the thought of doing yourself right now. By evening time, in a busy home, there were lots of evening chores to do and that was often one of them. It was a case of grit one’s teeth and follow orders. Anyway the ‘too many dirty porridge pots’ experience put me right off making the glubby stuff for breakfast for decades. Then a few years ago porridge became all popular and fancy and because I was blessed with a lovely little non-stick saucepan by that stage I thought I’d give it a go again (somehow the microwaved variety didn’t appeal). Made on skimmed milk, with a chopped banana and a swirl of honey or some berries it was actually quite nice and my little saucepan worked a treat. Rinse it immediately before anything got time to congeal, then stick in the dishwasher for its comprehensive wash and you were sorted. Now I eat porridge most mornings. The toppings vary – blueberries, chia seeds, a sprinkle of chopped nuts, there’s lots of choice to make a basic food special so I’m over the hating porridge stage – though I still wouldn’t put salt in it. No thanks.